Today’s Straits Times’ article on Gaia by Wong Ah Yoke has reminded me that I really ought to push out my post as well on this hidden gem! Gaia Ristorante is located at the illustrious Goodwood Park Hotel, and with a location like that, and an interior decor that spells fine dining, you would not be faulted for thinking that the prices are not wallet friendly. But depending on what you order, you could actually dine at Gaia Ristorante and have a good time without having to wash the dishes later! If you stick to the pasta main courses, they are mostly in the $20+ range. A black cod dish costs $38, while the pork costs $35. If you go for the more expensive meats like lobster, veal, lamb saddle and pigeon, that’s where the prices start to become steep. Desserts cost about $15, once again, quite comparable to some desserts at brand name cafes these days. 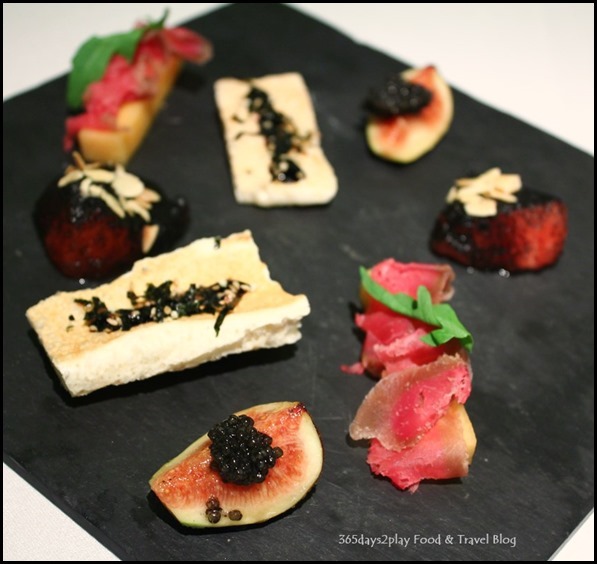 For our media tasting, the Partner and I sampled the degustation menu, which comprises 5 courses at $98++/pax. One thing I love about dining at such restaurants is that they always try to surprise you with some small canapes to kickstart the meal. You never know what you will be served but usually the items are pretty good and the chef has the flexibility to be creative with the ingredients he has on hand. 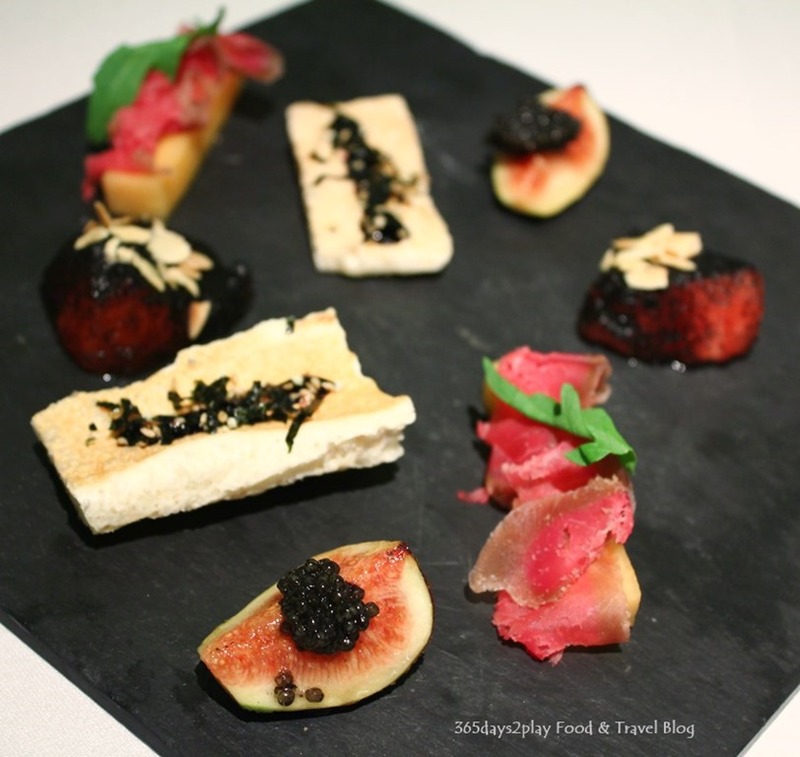 My favourite here was the figs with caviar, a sweet and salty combination that I’ve never tried before. At Japanese restaurants, I do not flinch when being served Amaebi, aka raw sweet shrimp. And in fact, I am not one to shy away from raw foods, I love raw meats! 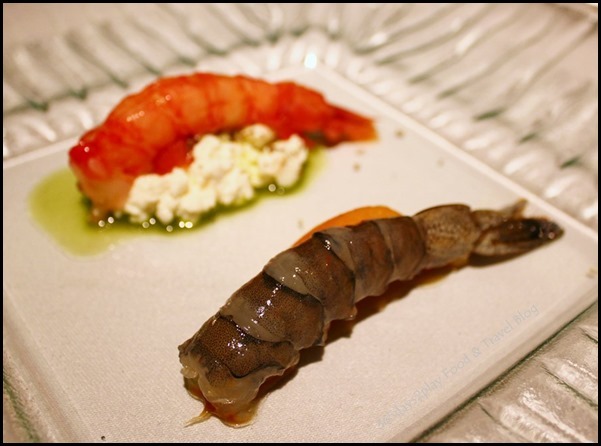 I’m not exactly sure why I did a double take, save for the fact that the blue Caledonian prawn looked like a raw tiger prawn, and tiger prawns are not commonly served raw. But the fact is that the red Sicilian prawn as equally as raw, and once I saw that fact, there was no stopping me from diving into this dish. If you have the opportunity, I really would recommend ordering this dish. This is where you can taste fresh prawns at their finest. They were so succulent and sweet that I feel as if I’ll never look at prawns the same way again. This is where you can savour the true texture of prawns that have not been marinaded in alkaline water (like in many chinese restaurants). They are firm but yielding with each bite.